This piece was started at a workshop I taught last spring. It was a request piece and I struggled to get it roughed out in a day but didn’t quite make it. People were patient with my trying to get the floppy sides dried enough to put together. (I didn’t use the naughty words I would’ve been using if alone in my studio.) Finished up the form later that day and then took several days to get it carved into the shape I wanted, tho it slumped a bit more in the firing into this shape. Used a multi-layered color scheme to go with it’s slightly off-beat shape. 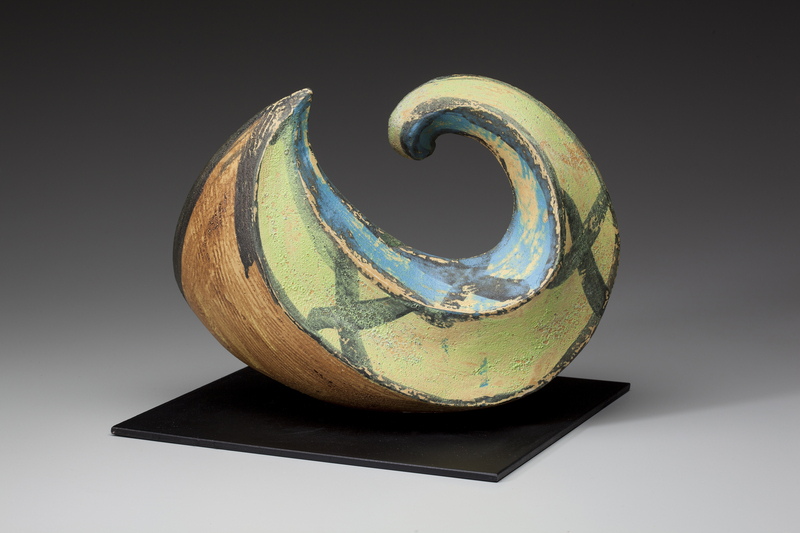 This entry was posted in Sculpture and tagged ceramic, clay, curl, Cynthia Spencer, multi-colored, Sculpture, stoneware, twist. Bookmark the permalink.